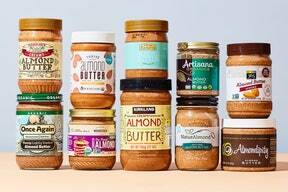 We tasted 10 brands of unsalted, unsweetened almond butter to determine the very best. Did your favorite make the cut? I don’t typically like almond butter, but in an Epicurious taste test to declare the absolute best almond butter among the growing number of jars that line grocery store shelves, I found one that I actually loved. One that I would intentionally buy again. Instead of being grainy, musty, or verging on rancid—my three biggest almond butter–related complaints—the winner was silky, aromatic, and slightly sweet (without any added sugars or fillers). We chose only unsalted, unsweetened almond butters for this particular taste test. If given the option, we picked “smooth” or “creamy” almond butters over crunchy, and ensured the nut butters had no other additives, like additional oils or preservatives. We steered away from raw butters, since it’s really not fair to compare the flavors of raw and cooked almonds, but made no delineation between “dry-roasted,” “slow-roasted,” or “lightly toasted”—the three most common adjectives used to describe almonds’ cooking process. All butters were stirred until fully emulsified, then tasted blindly by a team of Epicurious staffers with sliced pears and saltine crackers. All almonds, no filler. Well, almost. This nut butter is remarkably smooth, if a bit runny (fix that by storing it in the fridge). Commerce editorial assistant Zoë Sessums praised its distinctly rich “depth of flavor.” Even comparing it by sight to the other butters, you could see a difference: it was darker and almost the color of caramel, likely the result of a darker roast. Anya Hoffman was a fan of Crazy Richard’s “natural sweetness,” and several tasters mentioned wanting to drizzle it over oatmeal or an ice cream sundae. **This article was originally posted on Epicurious.com please read more here.